The new Yale and Lomas Parking Structure recently moved into the final stages of development. 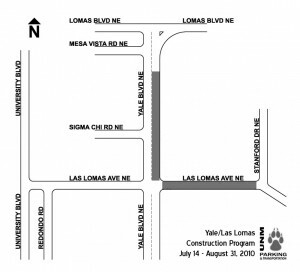 According to the University of New Mexico's Parking and Transportation Services department, road construction in the Yale and Las Lomas area will continue until Aug. 31. The areas immediately affected will be the northbound Yale boulevard lane between Lomas and Las Lomas, and both lanes of Las Lomas between Yale and Stanford. Additionally shuttle service throughout campus will be re-routed for the duration of the project and is expected to face delays. A representative of the Parking and Transportation Services recommend that drivers seek out alternative routes to navigate the campus. While access will remain available in the construction area, through traffic will not be allowed. 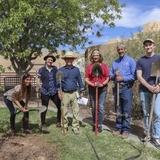 Updated information on the impact and duration of the project will be available at, UNM Parking and Transportation Services. Information will also be available at shuttle stops. Redondo (July 19 – Jul 25): Yale Mall, Redondo, Las Lomas (east), Yale (south), Duck Pond, Yale (north), Las Lomas (west), University (north), Lomas (east), resume normal route on north campus. 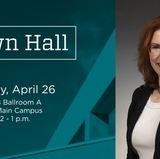 On return: Yale (south), Duck Pond, Yale (north); (*note: the President House stop is closed since Las Lomas east is closed), Las Lomas (west), University (north), Lomas (east), Stanford (south), Las Lomas (proceed on normal route to Yale Mall). Of course, riding G/Q shuttles from north campus to the Duck Pond is also an option. Redondo (25 Jul – 31 Aug): Yale Mall…Las Lomas (east), Yale (south), Duck Pond, Yale (north), Las Lomas (west), University (north), Lomas (east); ‘normal' north campus route, Yale (south), east on Los Lomas to President House. (Note: Presuming Las Lomas eastbound is open; if not, route will go to from north campus to Stanford (Hospital stop)). G/Q shuttles will transit all normal stops; however, since Yale northbound is closed between Las Lomas and Lomas, the shuttles will re-route: Duck Pond, Las Lomas (west), University (north), Lomas (east), Yale (north), and then resume normal route. 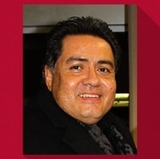 For more information visit Parking & Transportation Services online at http://unm.edu/parking or contact Brian Kilburn (505) 277-5692; email: bkilburn@unm.edu.